Controversial journalist and CEO of Rappler, Maria Ressa made headlines on both social media and mainstream media after she was arrested by agents of the National Bureau of Investigation (NBI) due to the cyber libel case filed against him by businessman Wilfredo Keng. The NBI issued the arrest warrant late in the afternoon and she arrived at the NBI Office at around 7:30 PM. The arrest of Maria Ressa was streamed live on social media by Rappler and other news media outlets. The arrest was made after the Department of Justice (DOJ) had indicted Maria Ressa and Rappler for cyber libel over a 2012 published article involving a certain businessman whom they reported lending an SUV to the late SC Chief Justice Renato Corana. Maria Ressa was at her office in Pasig City when the National Bureau of Investigation (NBI) agents served the arrest warrant but the NBI agents did not handcuff her. 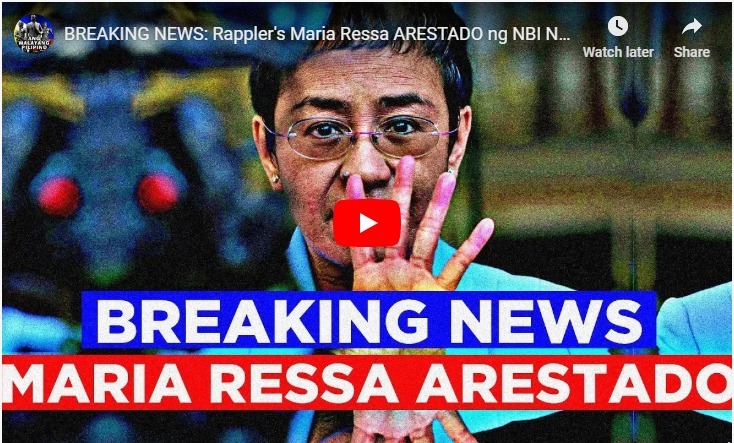 Maria Ressa's arrest was made after the Manila Regional Trial Court Branch issued the arrest the warrant against Ressa on Tuesday, February 12, 2019 according to Rappler. According to Justice Secretary Menardo Guevarra, Maria Ressa can post bail for the case. He added further that the Rappler CEO could have posted bail even before the warrant is served. In a resolution dated Feb. 4, Senior Assistant State Prosecutor Edwin Dayog said Rappler, Ressa, and reporter Reynaldo Santos Jr. committed libel under the Cybercrime Prevention Act of 2012.